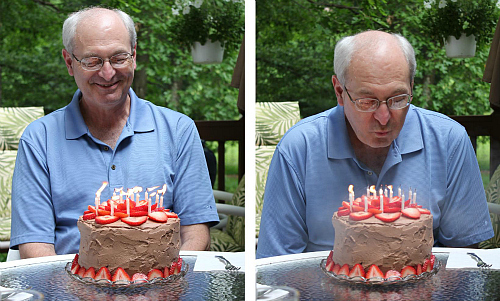 while our family was together on sunday celebrating father's day, we also celebrated ryan's dad's birthday. since june is the month for fresh strawberries, we knew we wanted to incorporate fresh strawberries into dessert somehow. we originally thought of making traditional strawberry shortcake, but then we decided to change it up a bit. 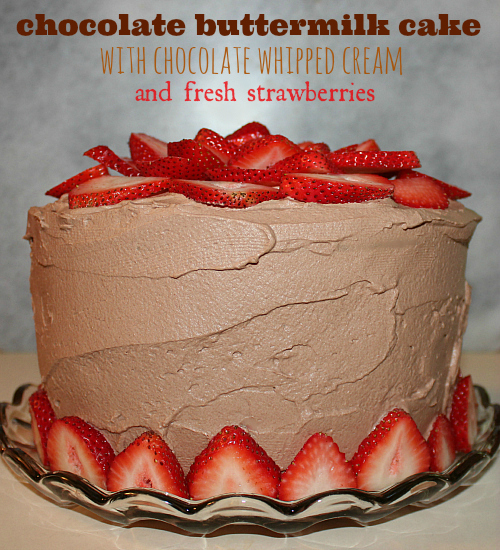 instead of vanilla pound cake or angel food cake, we made a chocolate buttermilk cake. the texture of this cake was almost like a chocolate pound cake. it reminded me a bit of a german chocolate cake. 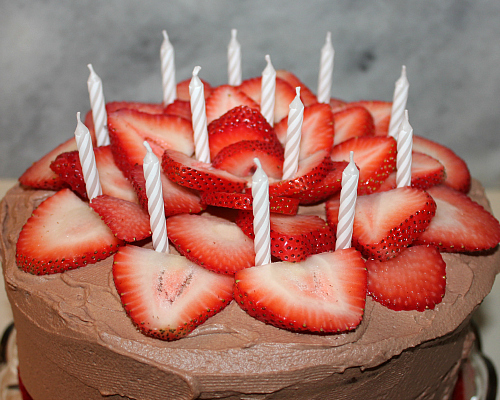 we topped the cake with chocolate whipped cream, which was a fun alternative to traditional vanilla whipped cream. we loaded tons of sliced fresh strawberries between the two layers of cake, and additional strawberries on top of the cake. this cake was so simple to throw together and it was super tasty. the chocolate whipped cream was such a nice alternative to buttercream frosting, and the fresh strawberries were so delicious! a perfect summer dessert for sure! happy birthday today to ryan's dad! place the chocolate chips in a double boiler over simmering water on low heat. stir occasionally until the chocolate chips are completely melted and smooth (about 5-10 minutes). remove from the heat, and set aside to let the chocolate cool. preheat your oven to 350 degrees F. grease and flour two 9-inch round cake pans, and line the bottoms of the pans with parchment paper. set aside. in the bowl of an electric mixer, cream the butter and sugars together until light and fluffy (about 3-4 minutes). add the eggs, one at a time, beating well after each addition. add the cooled chocolate, mixing well to incorporate. stir in the vanilla. sift the four and the baking soda together. add half of the dry ingredients to the batter along with half of the buttermilk. beat well to combine. gradually add the remaining buttermilk and dry ingredients (ending with the dry ingredients). beat well. divide the batter evenly between the two prepared cake pans. bake for 40-45 minutes, or until a knife inserted into the center of the cake comes out clean. once baked, allow the cakes to cool in the pans for 10-15 minutes before removing them from the pans and transferring them to a wire rack to finish cooling. combine the whipping cream, vanilla, sugar, and cocoa powder in the bowl of an electric mixer. whisk on low speed to incorporate the sugar and cocoa powder. once incorporated, whisk on high speed until whipped cream forms. once the cakes have cooled completely, spread some of the whipped cream on the top of one of the cakes. place sliced fresh strawberries on the whipped cream. cover the strawberries with more whipped cream, and place the second cake on top of the first layer. spread the remaining whipped cream over the top and the sides of the cake. 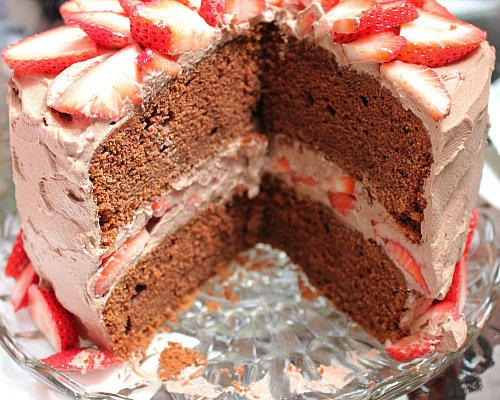 top the cake with additional sliced fresh strawberries. serve immediately. That cake tasted just as delicious as it looks. 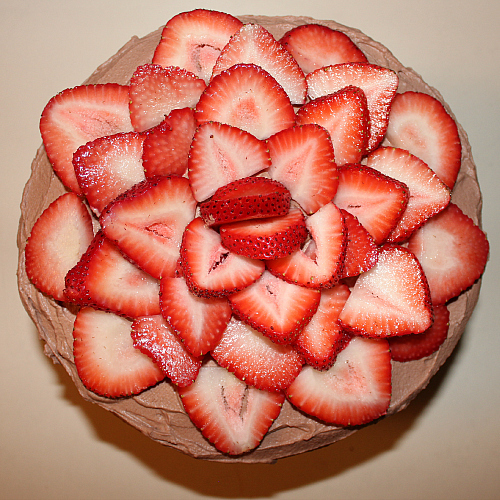 The strawberries form a rosette on top.